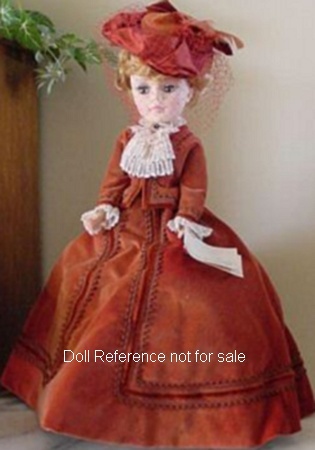 The Alexander Doll Company was founded in 1923, is still in operation today in New York, NY USA. 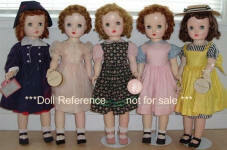 Dolls found on this page are the beginning of the hard plastic era 1948 on into vinyl dolls. 1948-1954 Alexander Maggie doll, 14-15, 17-18, 20-21, 22-23" tall, all hard plastic, jointed body walker - or non walker, floss human hair (not used after 1950), mohair, nylon or saran wig, chubby chipmunk cheeks, sleep eyes, closed mouth, more than thirty dolls used this face mold over the years, including 21" tall Portrait dolls; blonde Champ Elysées doll, red floss wig Pink Champagne doll of actress Arlene Dahl. Maggie face dolls are marked: Alex, Alexander or (usually) unmarked. 1948-1954 Maggie Teen doll, 14"
1948-1950 Alexander Mary Martin doll, 14 or 18" tall, the 14" doll came in a white formal, the 18" doll came in a sailor suit or chambray outfit. Short curly wig, sleep eyes, hard plastic jointed body, used the Margaret face mold. 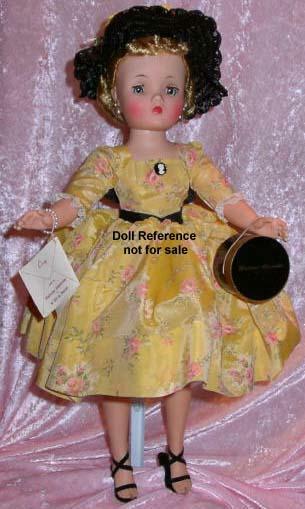 More than fifty-five different dolls used the Margaret face mold. Usually marked: ALEXANDER. 1948-1950 Mary Martin doll, 18"
1949-1951 Alexander Nina Ballerina doll, 14, 18 or 21" tall, blonde wig, all hard plastic with a jointed body, dressed in several various ballerina costumes, used the Margaret face mold. Usually marked: ALEXANDER. 1949-1951 Nina Ballerina doll, 18"
1950 Alexander Cinderella doll, Alexander Prince Charming doll, 14 or 18" tall, all hard plastic jointed body, both used the Margaret face mold, sleep eyes, closed mouth, wigged (her's is a fancy floss wig. Both dressed in outfits of satin and velvet. The Margaret face molds are usually marked: Alexander or Alex. 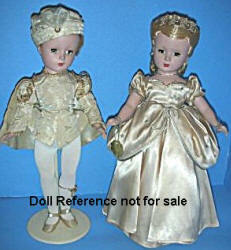 There is also a Prince Phillip 1950 and Queen Elizabeth II 1953, both are 18" tall. 1950 Cinderella doll, Prince Charming doll 14"
1952 Barbara Jane doll 29"
1952-1953 Alexander Cynthia doll, 15, 18 or 23" tall, all hard plastic black doll, jointed body, sleep eyes, wigged, closed mouth. Uses the Margaret face mold. Usually marked: ALEXANDER. 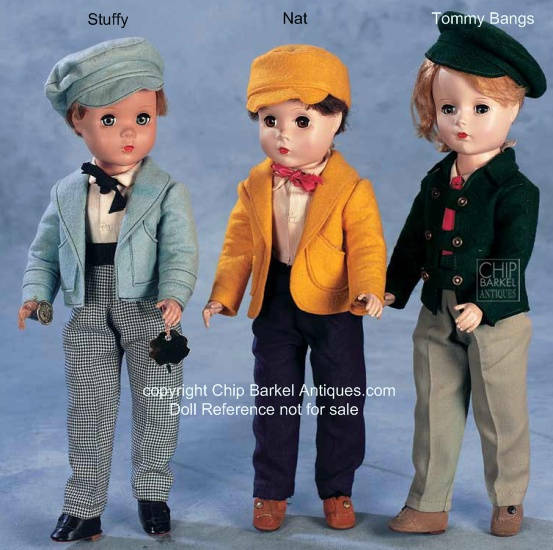 1952 Alexander Little Men dolls; Stuffy, Nat and Tommy Bangs, 14" tall, all hard plastic, jointed body, wigged, sleep eyes with real eyelashes, closed mouth. 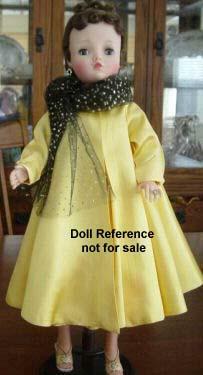 Chip specializes in Madame Alexander dolls, see his website for current dolls for sale. Stuffy, Nat & Tommy Bangs, 14"
1952 Alexander Rosebud doll, 16-18" tall, 1953 Rosebud doll, 13, 15, 16-18" or 22-25" tall, vinyl flange head, cloth body with crier, vinyl lower limbs both arms and legs, molded short curly hair, wigged or rooted hair, sleep eyes, closed mouth, doll marked Alexander. 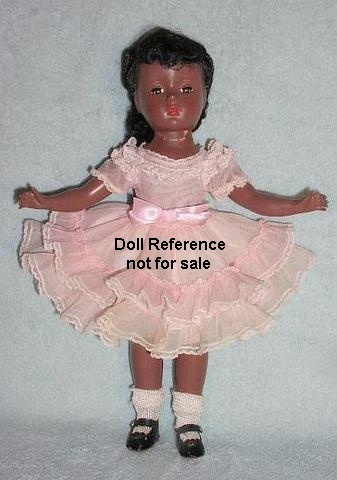 1986 Rosebud doll, 14-20", white cloth and vinyl or 14" black doll in cloth and vinyl. 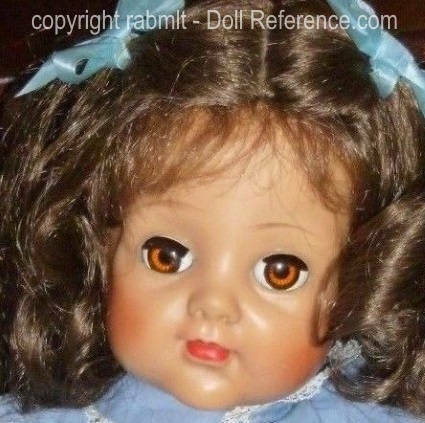 1952 Alexander Snow White doll, 14 or 18" tall, all hard plastic, jointed body, black wig, sleep eyes, closed mouth, used the Cissy face mold. 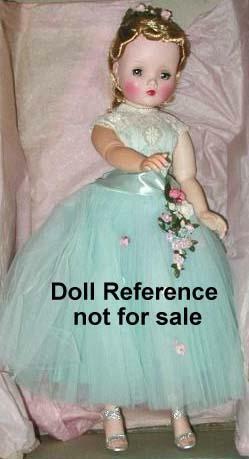 Usually doll marked ALEXANDER. 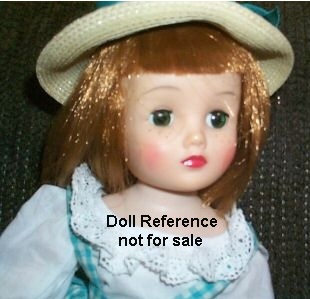 Doll shown in photo is all pristine and original. 1952 Snow White doll 18"
1953 Alexander Mary Ellen doll, 31" tall, all hard plastic jointed body, rooted nylon hair, single stroke brows, sleep eyes, smiling mouth usually marked: MME ALEXANDER. 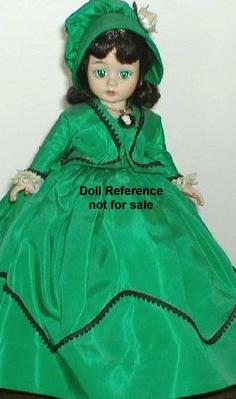 Doll shown in photo is all pristine and original and in her box. 1953 Mary Ellen doll 31"
1953-1955 Alexander Winnie Walker doll or Binnie Walker doll, 15, 18 or 25" tall, all hard plastic jointed body, wigged; the Winnie Walker doll has a wig that is glued on the head and the Binnie Walker doll has rooted hair on a a vinyl skull cap. Both used the Cissy face mold so this is the only way to tell the difference between the dolls. Usually marked: ALEXANDER. 1955-1959 1962 Alexander Cissy doll, 20-21" tall, hard plastic doll, jointed elbows and knees, high heel feet, sleep eyes and wigged, the Cissy head mold was used on some earlier dolls, clothes are tagged "Cissy", there were hundreds of outfits produced for her. 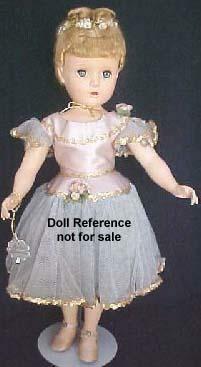 The later Cissy's did not have the upper arm joint. Usually marked: ALEXANDER. Modern Cissy's were re-introduced in 1996 to present. 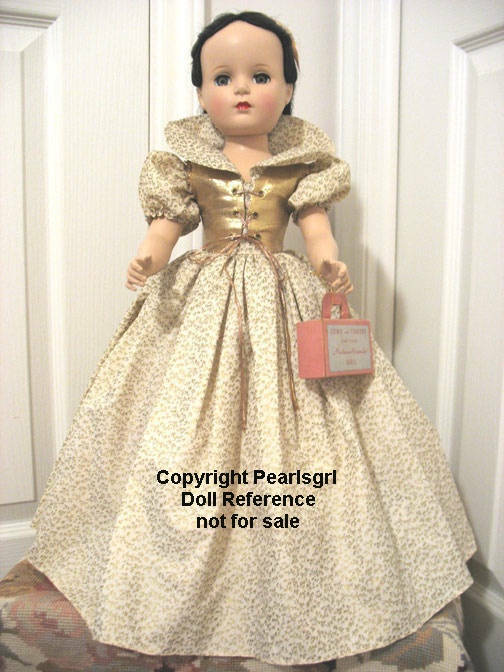 1956-1958 Alexander Lissy doll, 11 1/2-12" tall, hard plastic, sleep eyes, rooted hair various colors, high heel feet, dressed in many different outfits and as shown, some were matching to Cissy's attire. 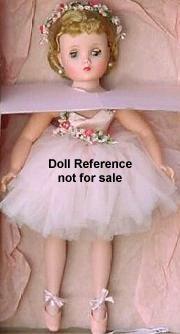 Dolls are usually unmarked. 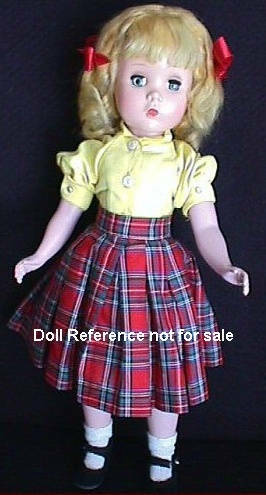 1956 Lissy doll 11 1/2"
1957-1964 Alexander Elise doll, 16 1/2 (1957-1960), 17" with vinyl head (1961-1962, 1967-1976, 1982), 18" tall with up swept hair-do (1963), hard plastic with vinyl arms, jointed at the neck, shoulders, hips knees and ankles, many different outfits were available. 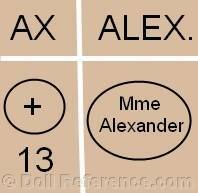 Usually marked: ALEXANDER or MeM ALEXANDER. Elise is shown wearing a beautiful tulle ballerina gown with flower accented waist and hair adornment and pierced earrings of faux pearls. 1957 Elise doll 16 1/2"
1957-1963 Alexander Cissette doll, 10" tall, hard plastic, sleep eyes, jointed at neck, shoulders, hips, and knees, high heel feet, dressed in #900 basic doll in a chemise. 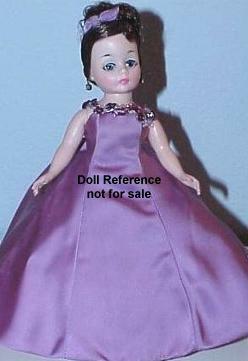 Dolls can be unmarked or marked: MmM ALEXANDER. Cissette had many different outfits including; Ball gown, Ballerina, Beauty Queen, Bride, Casual dress, Formal dress, Gibson Girl and others, shown on right is an original striped pink day dress. 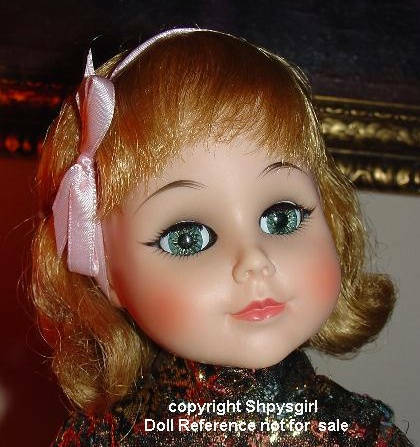 1958-1965, 1998 Alexander Marybel the Doll That Gets Well, 12, 15, 17 & 22" tall, uses the Kelly face mold, soft vinyl head, fully jointed body including waist, rooted hair, sleep eyes, closed mouth, usually marked Mme. Alexander 1958. Marybel came in a case with accessories to get well; wore pink satin shortie pajamas, robe and slippers or a wardrobe depending on year made, also plastic crutches, two plastic arm casts and leg casts, gauze bandages, tape, red measles spots, yellow chicken pox spots and sunglasses. 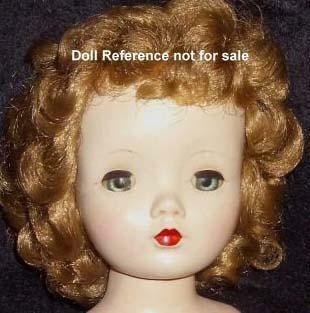 1958-1965, 1998 Marybel the Doll That Gets Well, 22"
1959 Alexander Shari Lewis doll, 14 or 21" tall, hard plastic, sleep eyes, brown wig, high heel feet, came dressed in several different outfits. The 21" doll used the Cissy body with this unique face mold, marked: MmE. 19 copyright © 58 ALEXANDER. 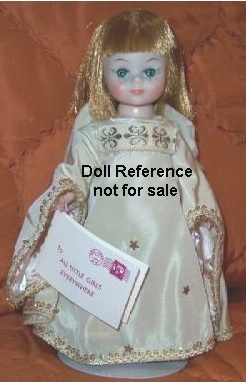 Shown at left is a close-up of the Shari face on the 21" tall doll. 1959 Shari Lewis doll 14"
1960 Alexander Timmie Toddler doll, 30" tall, 1960-1961 Timmie Toddler doll, 23" tall, hard plastic jointed toddler body, crier, vinyl head with short rooted hair, sleep eyes, real eyelashes, open mouth, wearing original pink and white romper. Marked: Alexander 1960. Value 01 Jan 2011, 23" tall doll $167.50 ebay auctions. Uses the same head mold as the Genius Baby doll who has a baby bent limb body. 1960 Timmie Toddler doll 23"
1960-1961 Alexander Maggie Mixup doll, 8 or 16 1/2" tall, the little one is all hard plastic with jointed knees, the larger size is hard plastic body, head and legs with vinyl arms, jointed at the elbows, knees and ankles, green sleep eyes with real upper lashes, freckles, bright auburn/orangey straight wig hair, marked on head: ALEX or ALEXANDER on back MmM. Alexander. Shown left is a 1961 Alexander Guardian Angel Doll, 8" tall with the Maggie Mixup face mold. 1961-1962 Alexander Jacqueline Kennedy doll, 10 or 21" tall, hard plastic body with vinyl arms, five piece jointed Cissy body, rooted brunette short hair, sleep eyes with real lashes, she came elegantly dressed as always; nightgowns, casual attire, riding outfit, and several evening gowns. 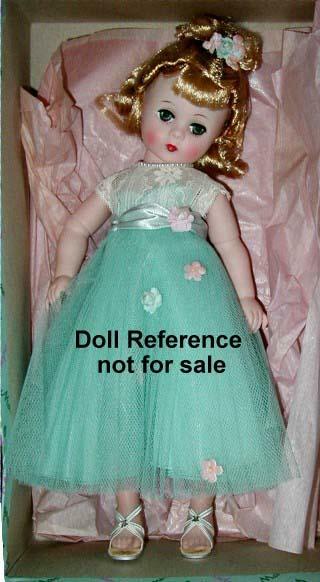 Doll marked Alexander 1961. Jackie is shown on left, in a beautiful full white satin ball gown with matching full length white satin coat, pearl earrings. 1961-1962 Caroline Kennedy, 15" tall, five piece jointed hard plastic body with vinyl limbs, rooted blonde hair, blue sleep eyes with lashes, open smiling mouth, shown on right in matching riding attire. Marked: Alexander 1961 or Alex 1959 13. Photo on right courtesy of Flozdolz. 1961-1962 Caroline Kennedy doll 15"
1961 Alexander Margot doll, 10" tall, uses the Cissette head mold, has heavier makeup, hard plastic, rooted hair, sleep eyes, several outfits; our photo is of Margot in a princess gored gown in purple satin with sequin trim on the neckline, and matching headband. 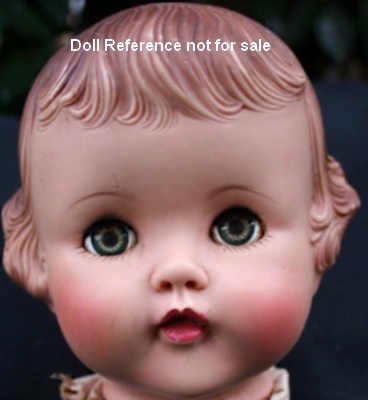 Doll will be marked like the Cissette head mold. 1962-present Alexander Portrait Dolls, 21" tall, vinyl dolls with rooted hair, sleep eyes; Sarah Bernhardt (in burgundy dress), Bride, Gainsborough (several gowns), Godey (several gowns), Madame Alexander (pink gown) & Madame Pompadour (in pink lace dress), Melanie (several gowns), Mimi (white gown pink trim), Queen (gold gown), Scarlett (many gowns), plus many other dolls. 1987 Sarah Bernhardt doll 21"
1966 Alexander Coco doll, 21" tall, (only issued one year) based on the designer Coco Channel, plastic jointed body including waist, vinyl head with rooted hair, blue sleep eyes, multi-stroke brows, real upper lashes, closed mouth, has a bent right leg, came with a clear wig box with hair piece, comb, hairpins and rollers. Usually marked: ALEXANDER 1966. 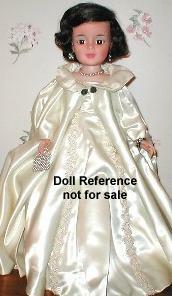 1989-1992 Coco doll, 10" tall, part of the Portrette Series. 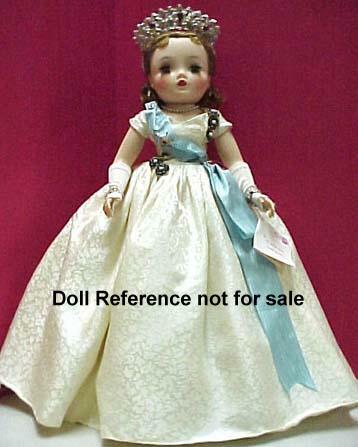 1997-1998 Coco was reissued as a 75th anniversary doll 16" tall. 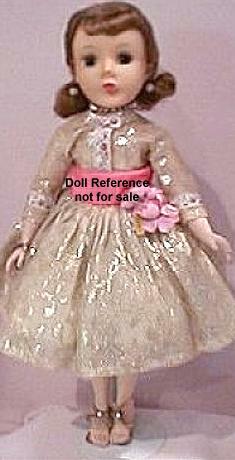 Photos courtesy of shpysgirl of the 21" Coco doll from 1966. 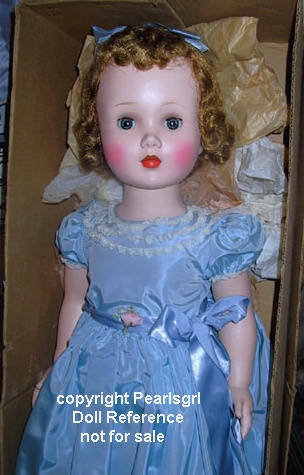 1966 Alexander Melanie doll, 21" tall, uses the Coco doll face mold, plastic jointed body, vinyl head with blonde rooted hair, blue sleep eyes, multi-stroke brows, real upper lashes, closed mouth, has a bent right leg, came wearing an elaborate blue gown with wide lace down sides. Usually marked: ALEXANDER 1966. 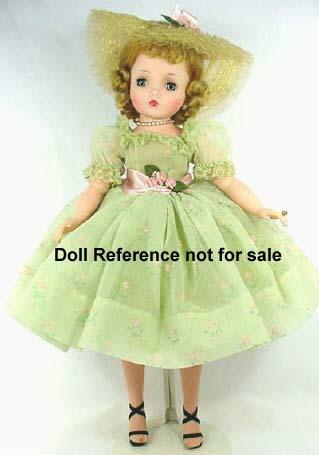 1968-1973 Alexander Portrette dolls, 10" tall, nine dolls in the Series; Agatha (1968), Godey Man, Melinda, Renoir, Southern Belle (1968-1970), Scarlett (1968-1973), Jenny Lind (1969), Melanie (1969-1970), and Queen Elizabeth (1972-1973). 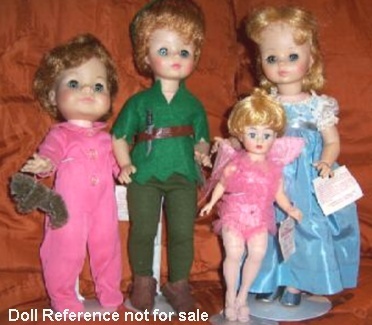 1968-1973 Portrette Scarlett doll 10"
1969 Alexander Peter Pan Doll series; 10-14" tall; shown left to right: Michael, Peter Pan, Tinker bell and Wendy. Vinyl head with rooted hair, plastic jointed body. Alexander did the Peter dolls several times over the years and in various sizes. 1948-1949 Alexander Karen Ballerina doll, 15-18" tall, all hard plastic jointed body, sleep eyes, wigged closed mouth, Margaret face mold, dressed as a ballerina, usually marked: Alexander or Alex. ca. 1948 Alexander Kathryn Grayson doll, 21" tall, celebrity doll, actress and Opera Singer, Portrait Doll with the Margaret face mold, hard plastic jointed body, sleep eyes with a double set of eyelashes, wigged, closed mouth, dressed in a pale beige strapless satin and tulle gown, usually marked; Alexander or Alex. 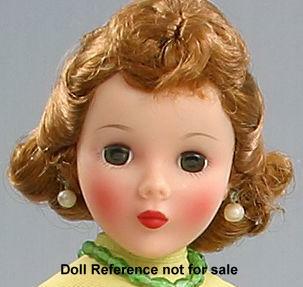 Other Margaret face mold 21" Portrait dolls are 1948-1951; Deborah Ballerina doll, Deborah Bride doll, Judy doll. 1951 Alexander Cherub dolls, 10 or 12" tall, vinyl head with molded painted hair and squiggle curls on forehead, brown painted eyes, red painted closed mouth, jointed at neck, one piece rubber magic skin toddler body with spread apart fingers, came wearing a cream satin gown with lace trim, angel wings and gold halo, dolls marked Alexander. 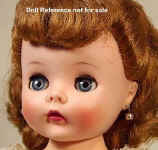 1953+ Alexander Quiz-Kins doll, 8" tall, boy or girl dolls with a button on back, all hard plastic jointed straight leg walker, molded hair, sleep eyes, closed mouth, dressed in a romper, bride, groom, girl's dress or as Peter Pan with a caracul wig, doll marked Alexander. 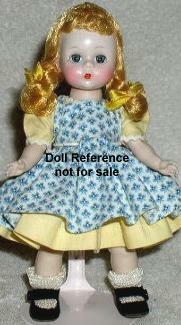 1954 Alexander Farmerette doll, 10 or 12" tall, same as the 1951 Cherub dolls, except came wearing a short sleeve one piece yellow knit top with green cotton bib overalls and matching sun hat, dolls marked Alexander. 1965-1970 Alexander Sound of Music Dolls, 8-12" tall, vinyl dolls with rooted hair; Friedrich, Gretl, Marta, Brigitta, Louisa, Liesl & Maria, yep - they missed Kurt in this series. 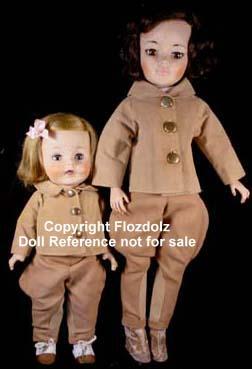 Also, 1971-1975 Alexander Sound of Music Dolls, 11-17" tall (this time they remembered Kurt).